In particular, we focus in on where they and others might want to prioritize their brand experience efforts when it comes to securing a more certain and positive future. 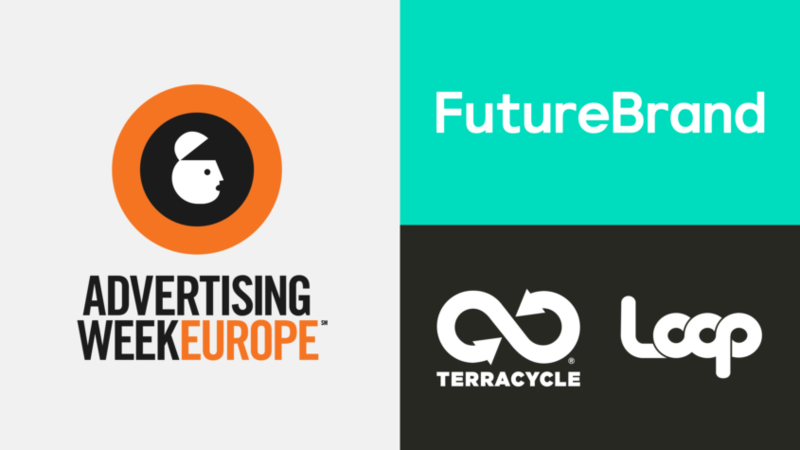 As the only rigorous assessment of how future proof the world’s 100 most prominent companies are, we ask an informed global public for their views on brands they are both aware of and know something about. 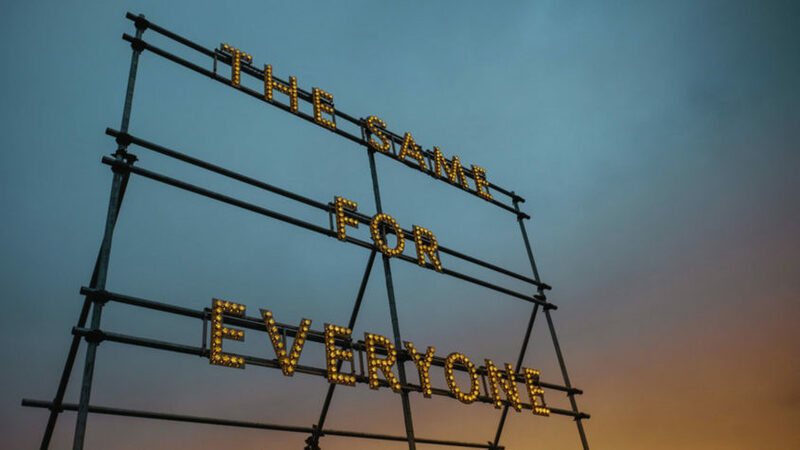 This year, we are seeing some dramatically polarizing perceptions of retail-based companies. Global fashion leader, Inditex (owners of Zara), Pull&Bear and Massimo Dutti amongst others, enjoy a high future proof position. While only in 98th place on PwC’s Top 100 by current market capitalization, the future looks positive for the company with a top 20 placing (13th) on our Index, for a second year running. Amazon, on the other hand, looks less future proofed than in previous years - dropping out of the FutureBrand Index top 20 (21st) for the first time despite, of course, showing strongly on current market capitalization with a PwC top 100 position of 4th. Finally, the future for Walmart appears to be currently far from certain dropping fully 45 places on the FutureBrand Index to 75th place. 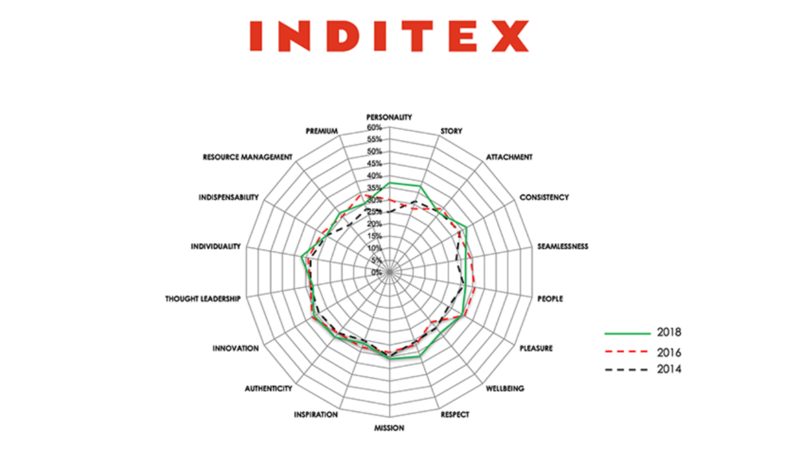 The drivers behind Inditex’s continued performance are a strengthening of perceptions associated with both the company’s purpose and the experiences it delivers. This suggests a well-balanced brand overall. On the purpose side, we see uplifts in the company’s individuality and resource management while most other measures have held up well. While on the experience side, we might infer this is where Inditex has really focused over the last couple of years. Big step ups in personality and story are further underpinned by a growing respect for their consistency and sense of promoting well-being, a powerful driver across much of this year’s study. Amazon is likely to be going through somewhat of a blip right now. Considering the way the company has changed our lives in so many ways, perhaps the most noticeable perception shifts this year are the declines in thought and innovation leadership. Perhaps the recent announcement of their new shopping reality show will begin to address this? 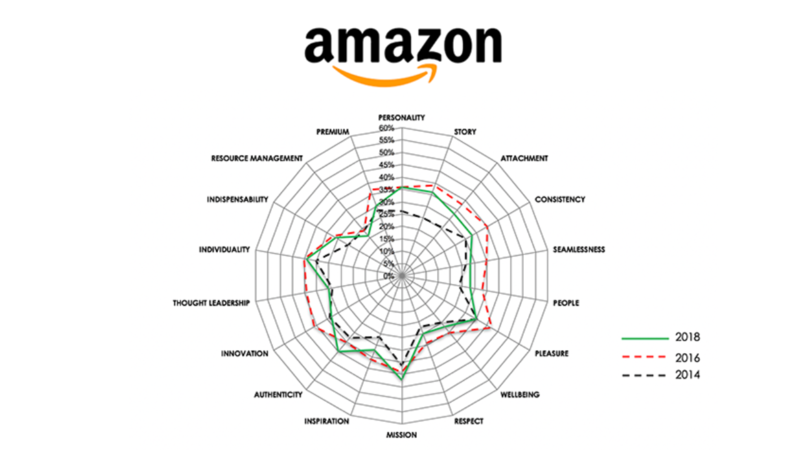 Whatever the remedies, perceptions associated with the Amazon brand experience such as trust, consistency, seamlessness, its people and the sense of well-being it brings the world have all dipped and need addressing quickly. If Amazon is suffering a blip then Walmart is simply suffering in the minds of our global public sample. Across both purpose and experience perceptions, the company is down except on basic indispensability. 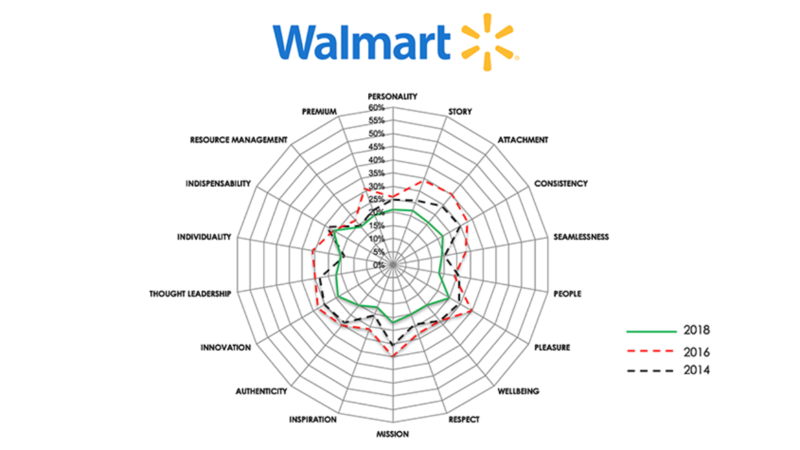 Walmart is less admired now than 2 years ago as indifference towards the company rises. The next two years are crucial and their strategic repositioning to compete with, ironically, the likes of Amazon must succeed. 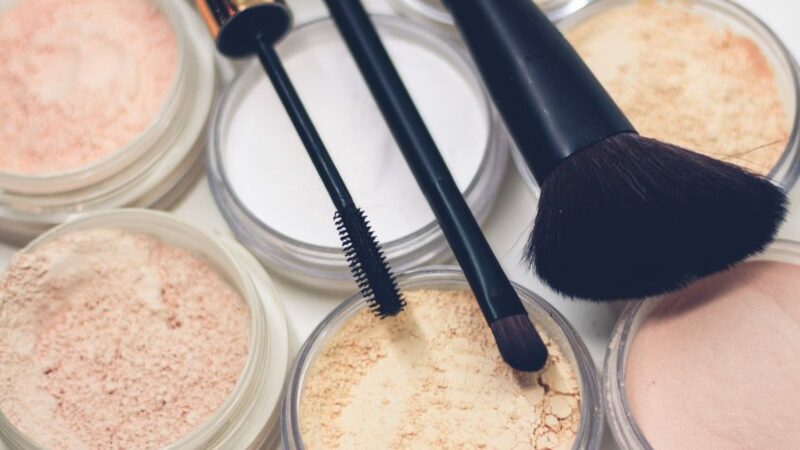 From a brand perspective, it is hard not to conclude that a revamp of both corporate purpose and associated experiences has to be on the cards.